Vancouver, British Columbia - October 25, 2018 (Newsfile Corp.) (Investorideas.com Newswire) Wildsky Resources Inc. (formerly China Minerals Mining Corporation) (TSXV: WSK) (OTC Pink: HWTHF) (the "Company") announces that the company has received final assay results from the 2018 drilling program on the historic tailings deposit at its Table Mountain property. In July 2018, 512 metres was drilled in 128 holes to test the gold content of the historic 'Erickson Gold Mine' tailings deposit at the Table Mountain property. Results for the tailings samples average 1.254 grams gold per tonne and range between 0.506 and 6.670 ppm Au (equivalent to grams gold per tonne; see table). Thickness of the deposit averages 4.0 metres and ranges between 1.2 and 7.0 metres. Gold is present throughout the deposit and is slightly higher (> 1.0 g/t Au) in the western half (see map below). This deposit has dimensions of approximately 175 x 150 x 4 metres, with an estimated volume of 105,000 cubic metres of tailings. The holes were drilled at a regular spacing of approximately 25 metres with a sonic drill. Each hole was 7.6 centimeters in diameter and the holes averaged 4 metres in depth. Hole collar positions were located using a field grid and hand held GPS. The cored material was collected in plastic tubes, which were then cut in half lengthwise. One half of the cored sample for each hole was bagged and shipped to ALS Laboratory Group Minerals Division in Whitehorse, YT for sample preparation, with geochemical analysis completed at ALS in North Vancouver, BC. ALS is an independent commercial laboratory that meets all requirements of International Standards ISO/IEC 17025:2017 and ISO 9001:2015. Analysis was by fire assay method using a 50 gram subsample, with the gold measured by ICP (analytical limits of 0.001-10 ppm Au). The other half of the cored tailings was shipped to Bureau Veritas - Metallurgical Division in Richmond, BC for metallurgical testing. Bureau Veritas is also an independent commercial laboratory that is compliant with ISO 9001 and with ISO/IEC 17025. QA/QC measures included a suite of 9 check assays performed by Bureau Veritas on rejects from ALS. Analyses at Bureau Veritas were by fire assay method using a 30 gram subsample, with the gold measured by Atomic Absorption (analytical limits of 0.005-10.000 g/t Au). Compared to the initial laboratory results, the check assays differed by -40% to +10% (average -12%). This amount of difference may be attributed to the presence of coarse gold giving rise to a nugget effect. Metallurgical testing is underway to assess recovery by gravity separation. Results are expected in the coming months. 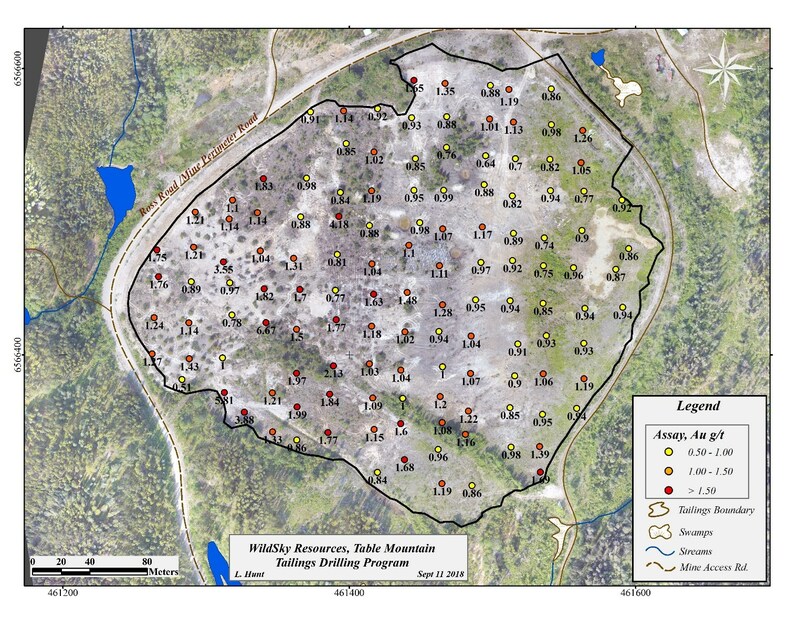 In addition, the Company is awaiting results from its 2018 soil sampling program conducted over the Lucky prospect, where results from historic 1986 sampling revealed highly elevated gold in soil values. The Lucky prospect is essentially untested by drilling. The technical disclosure in this news release was approved by Dr. Matt Ball, P.Geo., independent consultant to the Company and Qualified Person as defined by National Instrument 43-101.